A little sweetness sells a lot of wine. Niagara Wineries are finding great success with white wines that contain a little sweetness. And in many cases the spicy, exotic flavours of the Gewurztraminer. Flat Rock’s Twisted, Hillebrand’s Trius White and Inniskillin’s Brae Blanc have a big following and are likely to be joined by Henry of Pelham’s Sibling Rivalry 08 White (#4001353 $13.95). This kid is very zesty, very pretty and very summery. A crowd-pleaser for sure, but there is a simplicity that may find you wanting something else after your first glass. 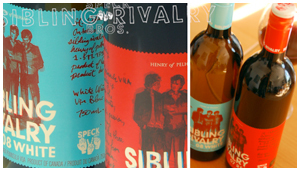 Sibling Rivalry 07 Red is also crafted in the want-to-win-you-over style – with spicy/sweet flavours and softness we associate with Aussie reds. Pelham is obviously going after the novice drinker with these wines and the question of the day is, does a winery with a reputation for quality and tradition risk damaging its reputation by introducing lighthearted brands?